In the Netherlands, It has been a beautiful May month! The warmest since a century! Well, what shall I say: ‘We have that in our pocket’ I really enjoyed it, spent a lot of time in the sun, walked outside and also painted an exterior wall! The outside wall, under our balcony. -I have a dike house and next to a garden we also have a balcony- (actually even 2) Under this balcony I can now sit and crochet. It has become a very cozy sitting area. And do you know what I hooked? 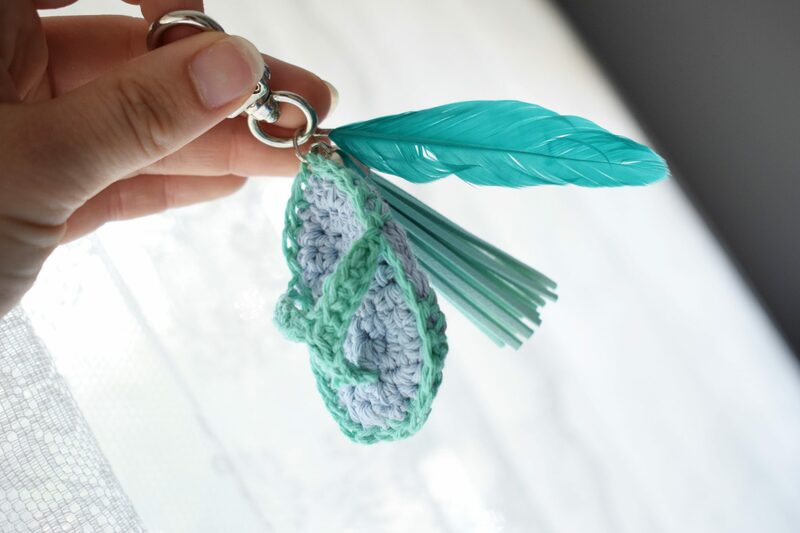 This fun keychain! A friend asked me if I could crocheting something like that, well I can and I want to! And there he is! 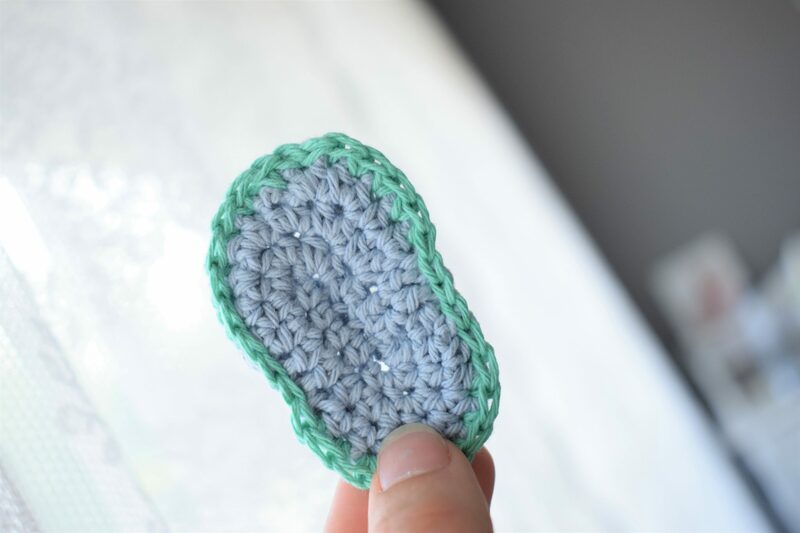 I have worked out the pattern for you, so you can also crochet it! Read on quickly! Round 2. In the first two stitches 2 half double crochet (hdc) in 1 stitch, 4 half double crochet (hdc), 3x 2 half double crochet (hdc) in 1 stitch, 3 half double crochet (hdc), 2x 2 half double crochet (hdc) in 1 stitch. Round 4. Put both soles together and take a contrasting color. Hook them together exactly, to each other. 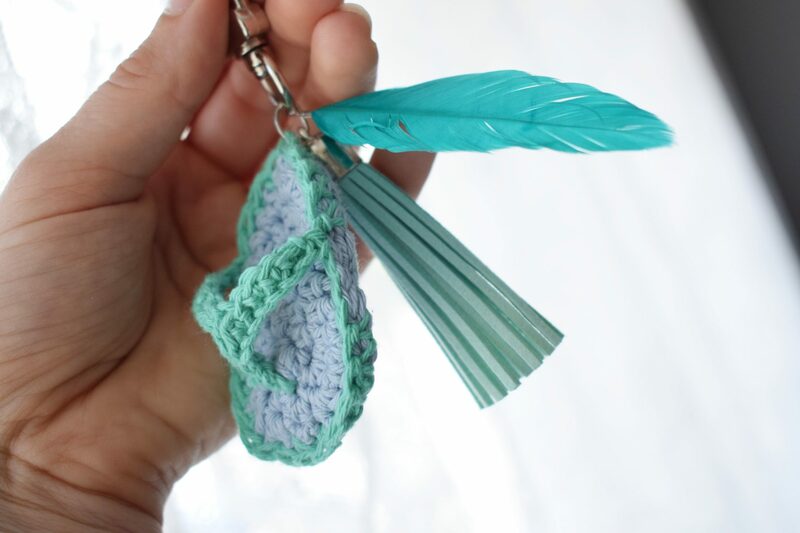 Do this with a single crochet. However, on the sides where we have hooked a slip stitch, you hook a slipstitch, on the sides you only hook 1 extra. Instead of 3 you hook 4 slip stitches. When you are back at the beginning, you attach and work the wire end neatly away. Round 1. 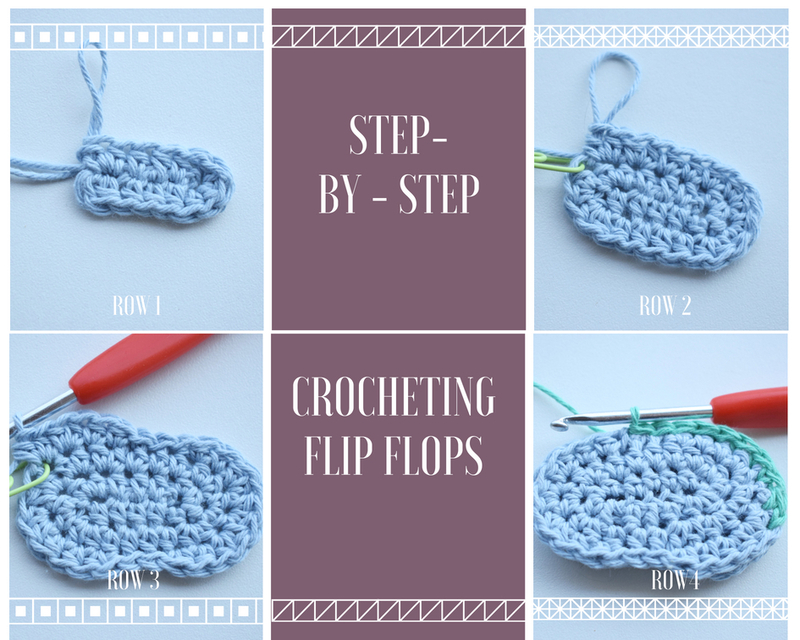 Place your crochet hook from right to left through the last half double crochet (hdc) of the 1st round. (The right side of the sole.) Attach the thread and hook 1 single crochet around this stitch, chain 9. With a slip stitch attach it in the 1st single crochet -next to the last crocheted slip stitch-. 1 chain and turn. Row 2. Crochet 1 single crochet in the next 5 chain, 1 slip stitch in the last 4 chain. Now you are back at the beginning. Now chain 5 and on the other side fasten him with a slip stitch in the 1st slip stich from the other side. Row 4. Crochet in the 5 chain 1 single crochet to the middle. Tie off and work your wires away. I have attached a feather and a leather tassel. He is also very beautiful on my bag! Crochet pattern for a girls dress- The Elice Dress!